Linear with Flow Pneumatic Transmitters offer, in one package, an instrument that mechanically extracts the square root of differential pressure and provides a pneumatic output signal that is proportional to the rate of flow. 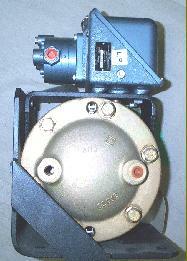 Models 273 &284 are actuated by the model 224 or 224C DPU. Models 274 & 285 are actuated by the model 199 DPU. ITT BARTON Models 273 & 274 Pneumatic Transmitters designed to meet the demands of maximum flexibility and service with a minimum of maintenance costs. Connection types vary depending on specs. Models 752 & 764 are differential pressure transmitters with an output of 4-20 or 10-50 milliamps. Used by the US Navy and Nuclear Power Plants. Please note: We do not sell Nuclear Safety related products at this time. Models 753 and 763 are static pressure transmitters. We have many instock.